Home Articles 30 Most Recognizable Wrestling Finishers. 30 Most Recognizable Wrestling Finishers. Hi everyone! Welcome to my list of 30 most recognizable finishers in wrestling. I did not rank them as it would be impossible to do fairly, so it’s in alphabetical order. Enjoy! Rey Mysterio named his unique Tiger Feint Kick finisher after his home state’s area code. Over the years, the spring board move which precedes it changed and continues to change. My personal favourite was 619 & West Coast Pop. As a martial arts fighter, Ken Shamrock was one of the first to use the ankle lock submission hold on televised pro wrestling shows. Kurt Angle adopted it years later, and won many championships in WWE and TNA with submission victories. 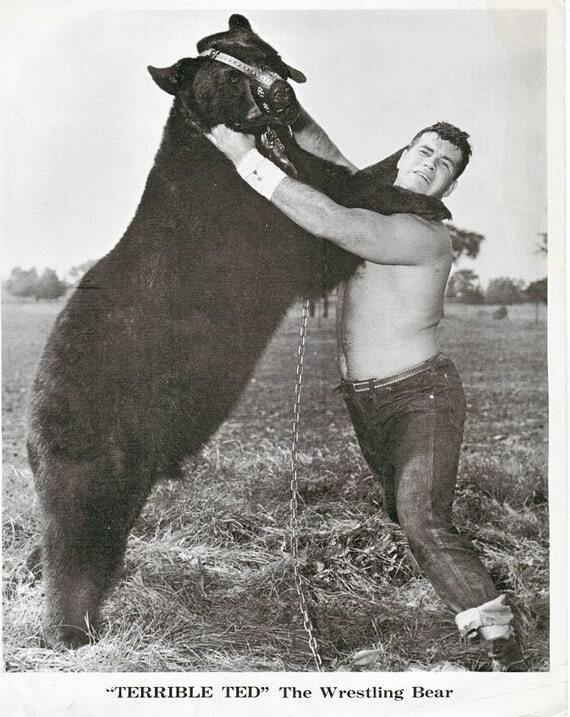 The Bearhug dates back to the 1950’s when wrestling featured as part of a circus act. “Terrible Ted” was the wrestling bear, and his handler offered a reward to any wrestler who’d challenge him in the ring. Ted’s finisher was the Bearhug, for which the body lock would become forever known. Many big wrestlers used it to weaken or defeat their smaller opponents: Bruno Sammartino, Andre The Giant, Giant Haystacks, just to name a few. If you were an Attitude Era kid, you gave your friends a Chokeslam at some point. I always liked how Big Show, Kane, and The Undertaker performed it differently. The move became more of a trademark over the years, but in the 90’s the Chokeslam was a feared finisher which could end any opponent at any time. Another move which originally featured as a finisher, yet gradually became a regular move anyone could add to their moveset. It inspired many variations, including Raven’s Evenflow DDT, Mick Foley’s Double Underhook DDT, Edge’s Impaler DDT, Tornado DDT, and so many others I’ll stop listing. 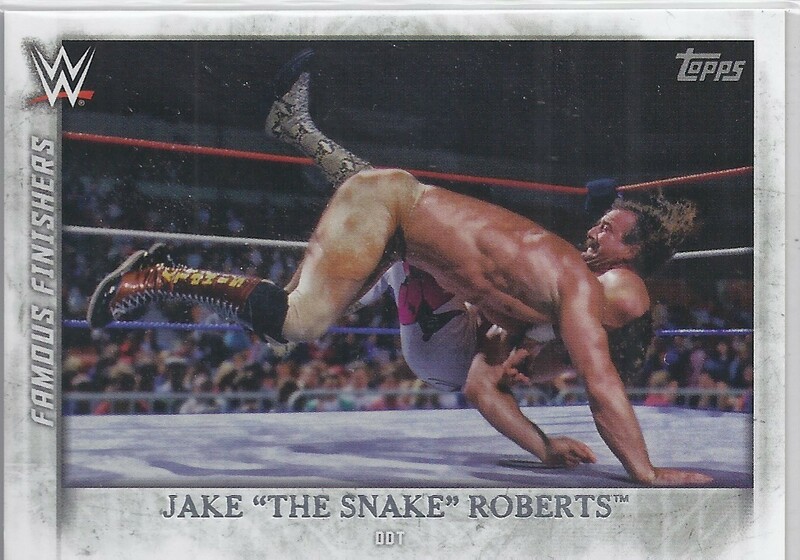 Jake “The Snake” Roberts takes all the credit for making the move famous. A brutal finish which helped to solidify the Legion Of Doom as the most popular tag team in wrestling history. There was no doubt .. when they hit the Doomsday Device, it was all over. The Dudley Boyz sometimes used the move in tribute to LOD. Just like everything in his life, the Macho Man took something as simple as an elbow drop and turned it up ten notches. 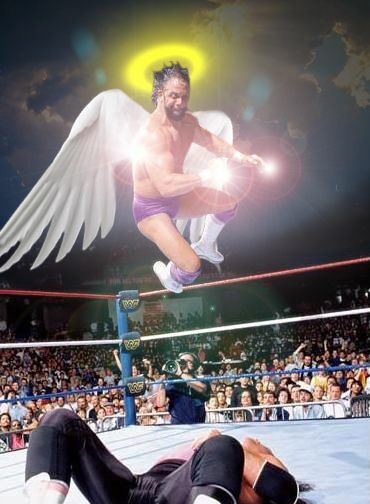 Wrestlers and fans often emulate, but can never duplicate the magic of a Macho Man Elbow Drop. Heavenly. The move which will forever be known as the one which ended The Streak. Need I say more? The move is devastating and belongs to one beast alone. The Figure Four is going to be around for decades thanks to Ric Flair and his opponents showcasing it during the NWA years. Arguably the most well-known submission hold. Charlotte Flair uses the Figure Eight variation to forge her own legacy. No .. This is not a Hurricanrana! A Frankensteiner is similar, except Scott Steiner is never looking to pin his opponent at the same time. It’s a power move, not a throw across the ring. Scott could do it from standing, but I found it most impressive when done from the top rope. As Steiner’s image changed he didn’t use the Frankensteiner as much, but he liked to surprise the older fans now and then .. by going back to what made him famous. KENTA (Hideo Itami) originally made the move known in wrestling circles in Japan. CM Punk liked it so he adopted it as his finisher in WWE, and it took him far .. but perhaps not as far as he hoped. The finisher is not in use as Punk moved on to UFC, and Itami remains injured. A devastating finisher only performed by Goldberg, it is rarely stopped and always leads to victory. Whether you love him or hate him, you cannot deny the popularity of the Jackhammer. The Lariat AKA “Clothesline From Hell”, is a simple and effective finisher only a select few made believable. Stan Hansen made it famous in Japan, and Kazuchika Okada continues the tradition with The Rainmaker. Bradshaw (JBL) springs to mind for most people. A simple low-risk move which made the WWF and Hulk Hogan famous. 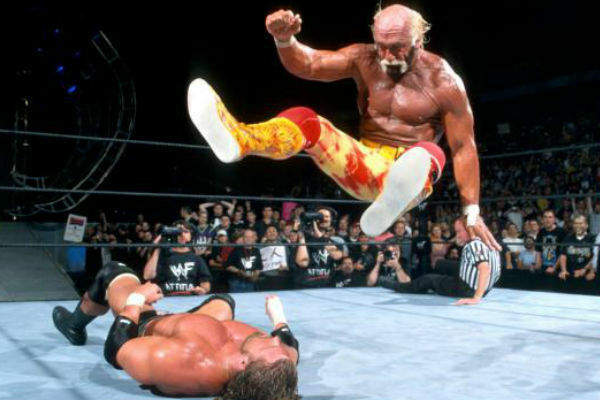 If you were a wrestling fan, you tuned in to see Hogan drop that leg on someone. Only when more powerful and flamboyant finishers cropped up in the 90’s did the move begin to look outdated and weak. Still, it’s a move we can’t forget as its etched in time. I don’t know about you but I freakin’ love the Moonsault. It’s blind, and totally dangerous .. but that’s why we love it right? Lita made it look like a casual stroll in the park .. have you ever tried to do a Moonsault? Some people can barely manage a front flip never mind a Moonsault from the top! Vader and Bam Bam Bigelow made it look easy too .. and the size of ’em made it all the more impressive. I hate the Pedigree because it reminds me of the days when Triple H beat my favourite stars. The key to its success is how brutal the move is when you think about it .. you’re essentially forcing your opponents body to the mat at high-speed while keeping their arms held so they can’t cushion the impact. A painful move which is highly associated with wrestlers being buried so far in to the ground they never make it to the main event scene again. Speaking of burials, have a Jackknife for your troubles! Powerbombs come in all shapes and sizes, but I like to think the Jackknife is the most recognizable. Of course, there’s Kevin Owen’s Pop-up Powerbomb and others, but there’s no denying people recognize a Powerbomb when they see it. Innovated by John Laurinaitis in Japan, the Cutter has been used by various wrestlers in different ways. Diamond Dallas Page brought it to WCW and named it the Diamond Cutter. The Dudley Boyz use a tag team variant called the Dudley Death Drop. Randy Orton called it the RKO and changed the setup to make it more surprising and impactful. The Cutter will be around for years to come. Is it a Powerbomb? Or a throw? I wasn’t sure so I gave the Razor’s Edge its own entry. The setup is often the most exciting part, as the crowd anticipates the moment Razor Ramon brings them down to earth. Sheamus used it briefly and called it the Celtic Cross.